Baitcasting reels take some practice to master but once you get the hang of it, it becomes an important tool for any angler who wants to fish larger lures, particularly when light spinning reels don't cut it. They allow you to pinpoint lure placements, offer high control over your lures and provide increased power to get your catch out from deep water or cover. Baitcasters are for those who have had plenty of practice perfecting their technique and professional anglers. This post takes a close look at some of the best baitcasting reels, examining their features. We also discuss factors to consider when choosing a baitcasting reel. But first, here is a quick look at what our top picks have to offer. The Piscifun New Torrent boasts bigger, stronger and reinforced main gear as compared to average baitcasting reels. It comes with Japanese Hamai Cut Gearing that offers dead stop power. The reinforced CNC brass gear provide precision cuts and feature stainless steel springs and screws for extra strength. There are three premium carbon fiber drag washers, which make fine tuning to power as simple as turning off the star drag adjustment. Also included are shielded stainless steel bearings that redefine smooth and free pool for fishing reels. 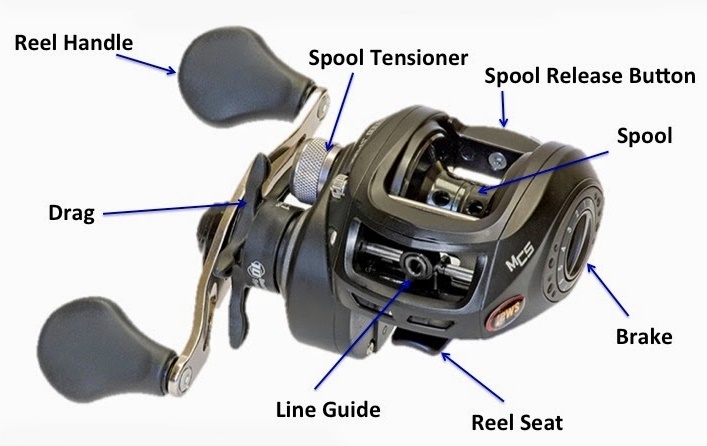 The reel uses a unique braking system that includes a dial-in-gauge for backlash control, and five strategically placed magnets for optimal magnetic effect on the ported aluminum spool. Piscifun incorporates a quick oil port design, a huge plus for anglers who always lose parts when doing a quick oil. The Piscifun Phantom is equipped with a featherweight carbon frame and side plate, making it one of the lightest baitcasting reels in its class. The dual brake system includes a 6-pin internal centrifugal brake and a 0-10 magnetic brake. It allows for precise adjustments to suit different baits, thus allowing you to maximize the cast distance. This low profile reel has a high gear ratio of 7.0:1, which offers great comfort when spending multiple days on the water. Another notable feature is the aircraft-grade aluminum alloy main gear and shaft. They provide consistent performance while improving gear durability. The CNC Hollow Duralumin spool starts and accelerates more quickly than larger spools. As such, it handles light lines well and lures better than traditional size spools. The oversized titanium line guide is positioned a little further from the spool to maximize casting performance and minimize friction. The KastKing Royale Legend is a sleek low profile baitcasting reel with chrome and red inlay. 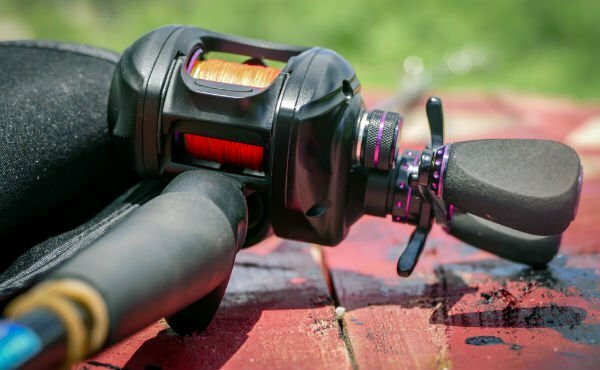 It is far from the average reel as it has a solid build and flawless performance. highlights include smooth action with multiple drag points, which allow you to fine-tune your casts and drop the lure where you want it to go every time. The three drag positions also help you reduce backlash. We love the centrifugal and 10-level magnetic dual brake system as it enables anglers to achieve maximum superior casting control. The unit has a 7.0:1 gear ratio and comes with 11+1 MaxiDur ball bearings. It is equipped with a ceramic line guide that is compatible with braided fishing line and monofilament line, thus giving anglers optimal high-speed performance. The oversized stainless steel handles have non-slip EVA foam grips for extra comfort. The spool is made from CNC machined and cross drilled anodized aluminum. The KastKing Speed Demon is a truly unique baitcasting reel, what with a 9.3:1 gear ratio that enables anglers to pull in line faster than ever before. The downside to having such a high gear ratio is that hauling your catch in becomes more difficult. It comes with 13 shielded ball bearings for increased efficiency and smoothness. The 3 disc carbon fiber drag system has the ability to handle 13 pounds of drag pressure. That equates to more fish than one would expect for a compact reel. This unit uses a magnetic brake system to eliminate backlash and give you more control. You can make adjustments to suit most situations, but some customers wished for more fine-tuning ability. This is a left-handed reel so right-handed users may have to look elsewhere. The cross-drilled aluminum spool does a great job of eliminating backlash. The KastKing Assassin Carbon Baitcasting Reel only weighs 5.7 ounces and balances perfectly with most rods. The midnight black finish gives it a sleek and classy look. KastKing used carbon fiber for the side plates, frame and handle to minimize the weight without sacrificing quality. Pairing a 6-pin centrifugal cast control with magnetic dual brake offers unprecedented fine-tuning, which comes handy when using lighter baits. The pins are adjusted using a dial located beneath the side plate. It takes minimal effort to cast thanks to the 11+1 shielded MaxiDur ball bearings and hard anodized aluminum spool. The unit is equipped with precision matched 6.3:1 ratio gears, braid line ready line guide insert and instant stop anti-reverse for hook sets. The 4 disc tournament ready drag system has a high capacity 16.5 pounds. The KastKing Rover Round is an extremely versatile baitcasting reel that offers all kinds of upgrades from the original RXA model. New and improved features include the carbon fiber drag washers, ergonomic thumb release out the bar and non-slip foam grips. It is available for left/right handed anglers and its corrosion resistance makes it perfect for saltwater fishing. It is bulletproof thanks to the incorporated anodized aluminum side plates and spool. Customers loved its superior carbon fiber drag system with a stopping power of 20 pounds. You don’t need to worry about the unit breaking or getting damaged when exposed heavy loads. It uses a centrifugal brake system to deliver consistent pressure on every cast. The 6+1 and 4+1 ball bearings are made from shielded stainless steel and allow for smooth fishing operations. 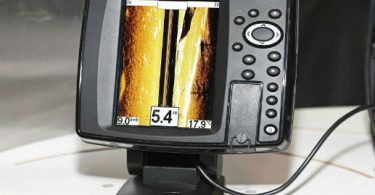 The Daiwa Tatula makes use of the company's T-Wing system and SV spool design to provide unprecedented performance. It is a particularly good purchase for those in search of a lightweight reel or something they can use to fish close to the shore. The unit offers an excellent balance of high-quality construction, smooth drag system, and high gear ratio. The advanced magnetic brake system allows for precisely controlled friction throughout the casts. This reel has a superior tournament carbon drag system with 13.2 pounds of stopping power. The Tatula HD baitcasting reel has a dark blue finish with subtle metallic flakes in the paint. It is sturdily constructed aluminum and comes with an ultimate tournament carbon fiber drag system with a maximum pull strength of 10.5 pounds. The T-Wing System is a nice addition and the fact that this reel offers 30% more line capacity than other models is good news to anglers. It is available in two gear ratios i.e. 6.3 & 7.3:1, both of which are available in right and left-handed configurations. Users loved the 100 stock handle as it offers extra leverage when turning the gears. The Shimano Curado I is built to be functional above everything else. Its durability and toughness is its focal point, but that doesn’t mean it sacrifices on smoothness and castability. The unit incorporates a few strength technologies including S3D and X-Ship that provide rigidity and increased stability when casting. It comes with 5 S A-RB ball bearings and is available in 5.5:1, 6.3:1 & 7.2:1 gear ratios in left and right-hand models. The drag at 12 pounds is a little low compared to most models, but strong enough to do what it was designed for. You can adjust the brakes with ease using the unique dial built into the edge of the frame. The Shimano Casitas boasts a high gear ratio of 7.2:1, making it an excellent choice for deep diving jigs. It is designed for retrieve with the right hand and has a 27-inch line retrieve per crank. The maximum drag is 12 pounds, which is decent considering the price. It has four ball bearings and one roller bearing, which ensure smooth fishing operation. the sturdy aluminum handle offers plenty of comfort when fishing for long hours while the stable spool improves balance during casting. 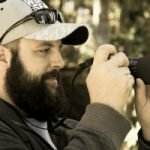 Brakes on your baitcasting reel are particularly important when casting in strong winds. The last thing you need is the wind slowing down your bait and the spool spinning faster than you want it to. A good braking system allows you to minimize backlashes as well as make long casts with different lure weights. The most common options include centrifugal and magnetic brakes. A magnetic brake is best suited to beginners as it works evenly at each step of the cast. On the other hand, centrifugal brakes are good for experienced anglers and work during the latter part of the cast. It also offers increased freedom to make any adjustments needed to adapt to strong winds or other environmental factors. The brake system works hand in hand with the tension system, which controls the line at the start of your cast, allowing you to make long casts with different weight lures. This help extending the life of your equipment by reducing friction between moving parts in the reel. A baitcasting reel with more bearings will give you a better cast. You should also consider the fact that fewer quality bearings are better than more poor bearings. The quality of bearings is usually ranked from 1 (lowest) to 9 (highest). You need a smooth drag since a sticky one will only let the fish get away. Proper maintenance after purchase will ensure that the drag stays smooth. The drag capacity comes handy depending on your fishing style. Consider the type of fish you are aiming to catch as well as the size of the lien you use. A maximum drag of 12 pounds will do for sail fishing but if you are bottom-fishing, an increased capacity of 20 pounds is more effective. 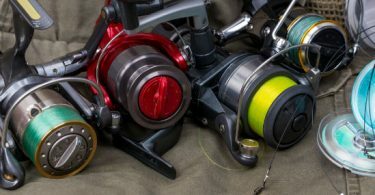 This is one of the most important features of a fishing reel and the ideal choice depends on the type of fish you are pursuing. You will definitely want to go for a heavier line if you are looking catch larger and stronger fish. The downside of heavy lines is that they take up more space on the line. You can circumvent this problem by opting for a model with a deep spool that can all of the line you need. An extra line to let larger fish make runs will come handy. If you want to bass fish, consider a lighter line and smaller spool that will offer the strength needed without sacrificing casting accuracy or versatility. The gear ratio affects the speed of lure retrieve and refers to the number of times the spool turns over when you rotate the handle once. It’s usually listed on the body of the baitcasting reel, making the selection process easier. A 5:1 gear ratio means that the spool turns five times during a single rotation. The higher the number, the faster the lure retrieve. A 4:1 gear ratio is considered low while anything above 6:1 is very fast. A slower retrieve is recommended for large spinnerbaits and diving crankbaits. A model with 5:1 is a good choice for jigs, Texas rigs or even soft plastics. If you are using lures that requires fast action, consider a model with at least 6:1 ratio. Modern baitcasting reels incorporate features that help with handling and comfort. However, everyone has unique hands and what is comfortable to you may not feel great in someone else's hands. Compact reels with shorter handles are good contenders for jigs or worms. However, you will need a larger, longer handle if handling big swimbaits and crank baits or need to winch fish out of heavy cover.